Armored = Clad or equipped with arms or shield; Covered with protection; Armor-plated. Strike = To hit with a sharp blow; To make a sudden action or impression; The application of physical force against something. Armored Strike = A sharp and sudden attack of fierce hordes physically made of steel and covered with metal plates. Memnite Buy, Kuldotha Rebirth Buy, Krenko's Command Buy, Signal Pest Buy, Lightning Mauler Buy, Hex Parasite Buy, Chimeric Mass Buy, Hellion Crucible Buy. Mox Opal Buy, Galvanic Blast Buy, Arc Trail Buy, Contested War Zone Buy, Signal Pest Buy, Banners Raised Buy, Hex Parasite Buy. Install free metallic artillery namely Mox Opal Buy and Memnite Buy to quickly draw first blood, then invite Lightning Mauler Buy to open doors for raging hordes. Assemble a massive goblin battalion through Kuldotha Rebirth Buy or Krenko's Command Buy, likewise assign Hex Parasite Buy to steer the heedless assault. 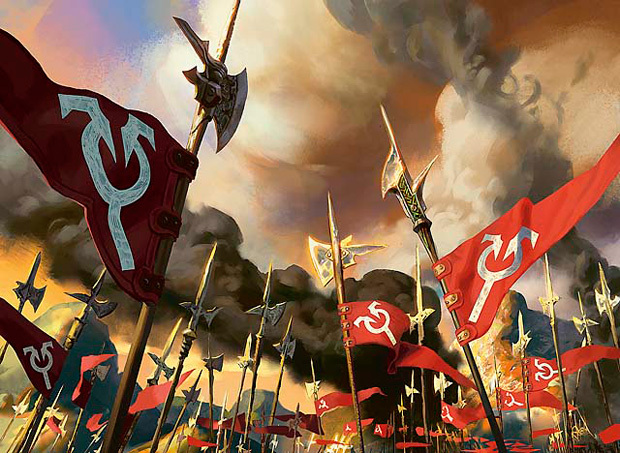 Empower the charging multitudes with Banners Raised Buy, Signal Pest Buy, and Contested War Zone Buy to bombard the enemy with overwhelming damages. Deliver the finishing strike by constructing a big Chimeric Mass Buy or by directly torching the opponents with a fast Galvanic Blast Buy and a fierce Arc Trail Buy. : Mox Opal Buy or Galvanic Blast Buy + Three Artifacts you control. : Kuldotha Rebirth Buy + Any Artifact you control. : Lightning Mauler Buy + Any Unpaired Creature you control. : Contested War Zone Buy or Signal Pest Buy or Banners Raised Buy + Attacking Creatures you control. The name of the deck was carefully thought of in order to reflect its theme and features. The code written beside the deck name indicates its motivations for construction as denoted by the legend below. Armored Strike was inspired by the student activities performed in our university during the season of its construction. It was first conceptualized in April 1, 2011. Since that day, the cards included in the deck were bought and playtested until the most recent and efficient build was achieved. Armored Strike was legal in Standard tournament format until September 2012. Please provide accurate ratings and honest comments to this deck. All worthy ratings and comments shall be returned to as many decks as you want. Thank you very much!